It's a lazy Mom-day; I'm whipped for no specific reason. Awakening at the crack of dawn, I decided that a trip to the throne room couldn't be avoided, but I could always jump back in bed. It's a national holiday, by cracky, and that is how I'll celebrate. 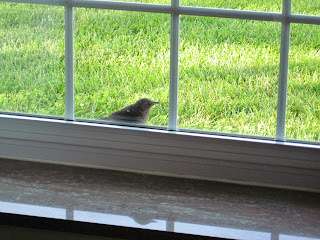 As I wandered past one of the windows, once again, I saw it: a bird staring at me. Now, I know you'll think it just landed on the window ledge outside; I thought that, too, the first hundred times it happened. That is, until I walk up to them and spend some time in a mutual stare down. Shouldn't birds just fly away, frightened by the specter of a barely coherent humanoid-type chick? Nope. They just stare at me; I'm birdseye-invisible. I get my camera, because I'm that kind of humanoid (and the bird is willing to wait, he has no where else to go right now). You know just the kind I'm talking about - the kind humanoid that takes pictures of stupid things and forces her friends to look at them later on. Like now. "Howdy...you need a new nightgown." As unlikely as it seems, I suspect animals stalk me. Maybe I'm secreting some animal lover pheromone or perhaps "friendly human" has a smell (maybe they'll hate me after I shower). Or they just like me; I can't decide. But there's something that is alternately awe inspiring or weirdly cordial about the way critters will stop and stare at me. This doesn't happen to anyone else in my family. "If you could just hold me while I decide where to fly..."
The picture above is a goldfinch. 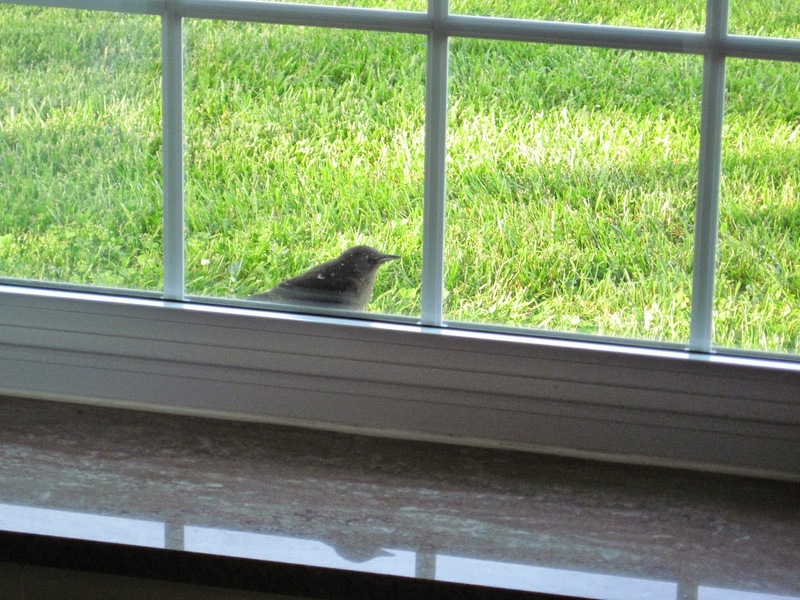 It was sitting in the yard, so I tried to see how close I could get to one of my stalker birds. Turns out, I can get close enough to reach down and pick it up! My eyes scanned the bird from all angles and I couldn't see a thing wrong with it. My son, excited at the prospect of a critter interaction, begged to hold it. 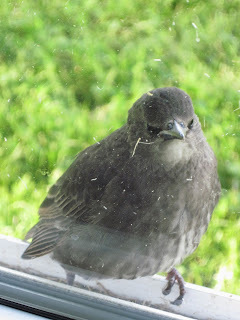 No problem, I thought, this is one freakingly agreeable finch. The bird saw things differently, twisting and turning till it got free from his hands and flew into the bathroom...where I walked over to it and it calmly got back on my hand. Bird and I hung out together for about fifteen minutes and then I walked out in the yard, held my hand up near our big oak and it flew away, without hesitation. 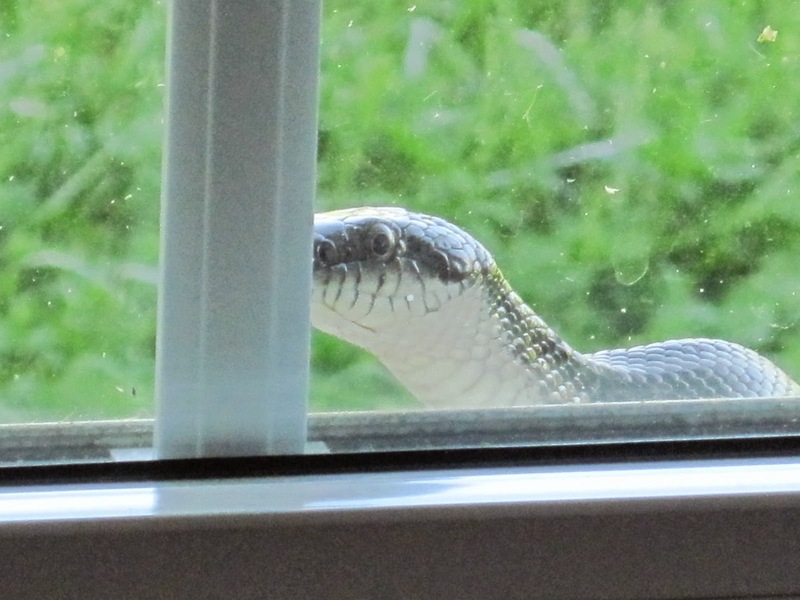 It's not just birds...why would a snake stare at me through the window? What would a snake find interesting about watching me working at a desk. Desk envy? You know he can't type. Rabbits, squirrels, a goose, strange dogs and a groundhog have all stopped and stared in the window or the screen door. You're making me a little paranoid, mother nature. Oh, I love it most of the time. All this to say, critters - I know that you get the short end of the stick on many issues. Today is labor day, and strangely, it's a day when many humanoids don't labor. I extend this opportunity to all of the critters who feel it's their job to keep an eye on me. It's your day off. Enjoy. I felt like someone was watching me as I brought in groceries. Happy Labor Day, dear Cherdo! Thank you for showing us the miracles of Photoshop because, surely, (Shirley?... Cheryly?) these images can't be real! The only way to explain why that yellow bird would have allowed you to pick it up and hold it, assuming it is not sick, is that it is somebody's lost pet that escaped from its cage and wound up in your yard. BOLO for "LOST BIRD" signs nailed on utility poles in your vicinity. I am not at all surprised that all sorts of exotic animals come to your windows and spy on you. Every morning a pesky giraffe peeks through my bedroom skylight and watches me get dressed. Yes, I wear a bra! (see my comment on Janie Junebug's blog) By the way, Janie posted some kind and well deserved words about you today. Have a safe and happy day, dear friend Cherdo! I've only got a few minutes - on the lookout for the missing bird signs. The only info I can offer is that it went thatta way (pointing up). That's the other thing that causes me to pause before retiring in Florida...the African wildlife. You know that giraffe is only looking through your window because it is lost, and if you'd take the time to look outside, I'm sure a herd of hippos are weeping at its feet. Isn't it enough you have the 1000 lb. gator to contend with - must you also be burdened with the lingerie leering lost long necked giraffe? Whew. That's a lot of alliteration for a holiday. Janie is the bomb. THE bomb, not a bomb. Be well, air-conditioned and happy! The critters that like me the most/ are the tiny ones that bite!! I'm now a follower. That goldfinch is exceedingly sweet. I'm still amazed by the goldfinch. I can't explain it, so I'll just celebrate it. Happy Labor Day - hope you're having fun! That is amazing that animals are attracted to you. They are attracted to me too, but many won't let me get close like that. 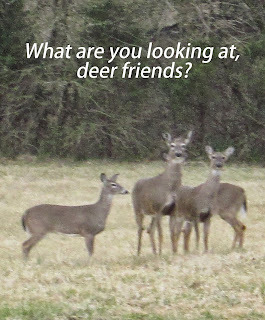 I also don't think they stare at me. It sounds crazy, that is why I find it amusing. So pretty. That sounds like a perfect Labor Day to me. Gotta love the critters... Hope you had a good day, Stephanie! We had a lot of goldfinches hang out around our house in Maryland. I never tried to hold one, but they'd let me walk up to them. As for the snaaaaake, NOOOOOOO! Thank you for considering me the bomb. You had me at "trip to the throne room." I like that in a writer. Sent by Janie Junebug. Think I'll stay. So now you know who to blame. ...and that's why I love Janie Junebug. Glad to have you. Loving all of the critters...well, except for maybe the snake. I'd freak out if I saw one in the window! My mother puts out seed every morning for the birds and the cats have a ball watching them come so close to them. One of their cat houses is right next to the window where they feed.